Opening of Weird Cars Exhibtion (March 21st 2005). The National Motor Museum, Beaulieu. (U.K). 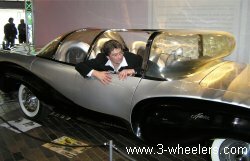 On March 21st 2005 I was delighted to be invited by the National Motor Museum in Beaulieu to the opening of their new “Weird Cars” exhibition which is running until March 2006. As Sue was also invited we both went along and arriving soon met up with Stephen Vokins. It’s Stephen’s new book “Weird Cars” that is the inspiration for the exhibition with many of the cars in the exhibition also appearing in the book. After a rather nice cup of tea and a couple of deliciously crunchy biscuits, Andy Saunders took the microphone and gave an amusing speech about how his passion for customising cars began. After he had finished, it was mentioned that even his bed is a specially converted Ford Capri. Without thinking a lady who now has the microphone says, “that’s something I’d like to see”. I sniggered, “Ooeer” I thought, she wants to see his bed. Alas all seemed silent and I thought, is it only me who has a dirty mind ... luckily everyone then burst out laughing. I was relieved, it seems everyone else was thinking the same as me. Following all the Press folks we wandered across to the Museum and Andy did the deed of cutting the rope. Naturally with a pile of cameras on him he had to strike various poses over and over pretending to cut the ribbon. In the exhibition are two amazing cars, one is the X2000 built by Andy and the other is a 1957 Aurora restored by him. The cars were stunning and everyone flocked around them and it was like watching fireworks as all I could hear was ... oooo, ahhhh, ooooo. As grand as they may be they had a wheel at each corner and my eye was already captured by a 1962 Scootacar in the corner. Glancing around the room I was amazed at just how many cars in the exhibition were 3-wheelers. Fantastic, I thought, and pulling out my camera started to snap away. I have never seen a Scootacar close up before and as imagined they are quite high, which I guess is why it used to be advertised as “having a full sized car door. 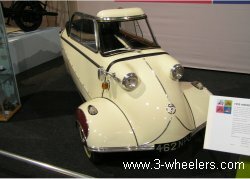 Along from there was a 4-wheeler, (Africar) and next to that (see how effortlessly I whizzed passed a 4-wheeler there) was a gleaming 1955 Messerschmitt KR200. It’s a pity that you rarely see these on the roads now, I always recall seeing a blue one years and years ago struggling up a steep hill, the engine screaming away. When it got to the top it then hit the sound barrier as it flew down the other side. 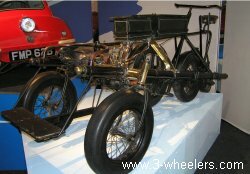 Opps, I digress, next to the Messerschmitt was a rather fascinating 1896 Pennington Autocar. Boy oh boy did they drive some scary looking machines all those years ago. I seem to recall reading somewhere that the driver sat on the back because then if it crashed he had time to jump off! Pity about the nine passengers clambered all over it though. Looking over the Pennington stood a 1964 Peel P50, majestic and proud ... well as majestic and proud as a car measuring 53” (1.34m) x 39” (99cm) can be. 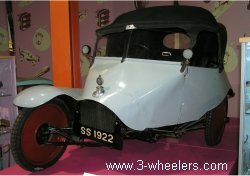 It’s funny as several of the museum folks at Beaulieu all say that this is their favourite car in the whole museum. 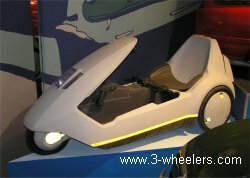 Sitting in its shadow was a rather clean and shiny Sinclair C5. Most of the ones I’ve seen recently have had marks all over them so this one looked really clean and new. Sue by now had vanished and I spotted her looking at some collectible oddities that are also on show at the exhibition, things like a Clockwork fire blower (c 1900), Disposable spittoons (c 1905), and a Birdie horn. Apparently during the 1920’s sports cars were toys of the rich. So when you wanted to attract attention the birdie horn gave out a loud whistle. Presumably once noticed, one then smiles and shouts “all right darlin”. Circumnavigating the Aurora, which everyone keeps saying is the ugliest car in the world (I’m sure the old Fiat Multipla was far uglier) I came across a 1962 BMW Isetta. 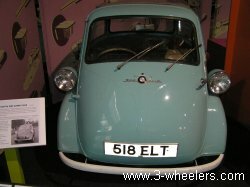 These always make me smile as some folks charge around in their “10 gigawatt lightning enduced, supercharged my cars faster than yours because I’ve got 9 exhaust pipes BMW” and will actually deny that BMW made such dainty little cars like the Isetta. It must be the only BMW that I’ve never seen tailgating me - so for that reason (and the fact it has 3 wheels) I like it. What I also liked was the 1922 Scott Socialble next to it. 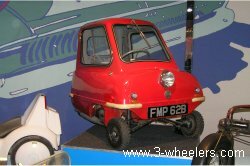 This is a rather fascinating 3-wheeler as the single front wheel is in line with one of the back ones. You can really see how Scott Motorcycles stuck a sidecar on and thought, “hey, if we put a roof on there we have a car”. I admit it was originally designed as a machine gun carrier of which it probably performed its service admirably, but as a family car it looks very precarious. The other cars were 4-wheelers but they included an amazingly scary 1922 Leyat (scary because it has a big propellor in front of it - so you would not be too happy if the thing ran you over) and a BMC Sphynx that looks like a 3-wheeler but actually has one wheel at the back, two in the middle and one at the front! All in all the exhibition is really good and especially so if you like your 3-wheelers. So if you fancy a day out I can highly recommend it. Don’t say “Elvis sent me though”. They will just think you are totally daft and get the security guard to keep a watchful eye over you! 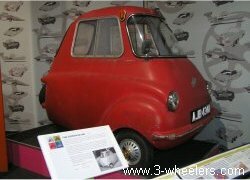 After looking around the Weird Cars exhibtion we also had a look around the museum and found a few 3-wheelers there to. I have added this to the site as a separate entry here. Andy Saunders cuts the ribbon to open the exhibition. Andy Saunders poses for the press in a 4-wheeler everyone seems to describe as the ugliest car ever built - the 1957 Aurora.